Republicans have a long history of denying climate science, but a new study shows that a plurality of Republican voters in all 50 states believe that global warming is occurring—but they are not convinced that human beings have anything to do with it. Environmental and political science researchers from University of California- Santa Barbara, Yale University, and Utah State University wanted to study the differences between the way Republicans and Democrats viewed global warming and climate change. Between 2008 and 2016, they collected answers to questions about energy and climate policies from nearly 5,700 Republican voters and more than 6,000 Democratic voters. In their analysis published today in the journal Climatic Change, they found that Republicans living in Democratic-held congressional districts “tend to be somewhat more concerned with climate change.” In blue enclaves like New York City, Miami, San Francisco, and their surrounding areas, the number can soar to 66 percent. 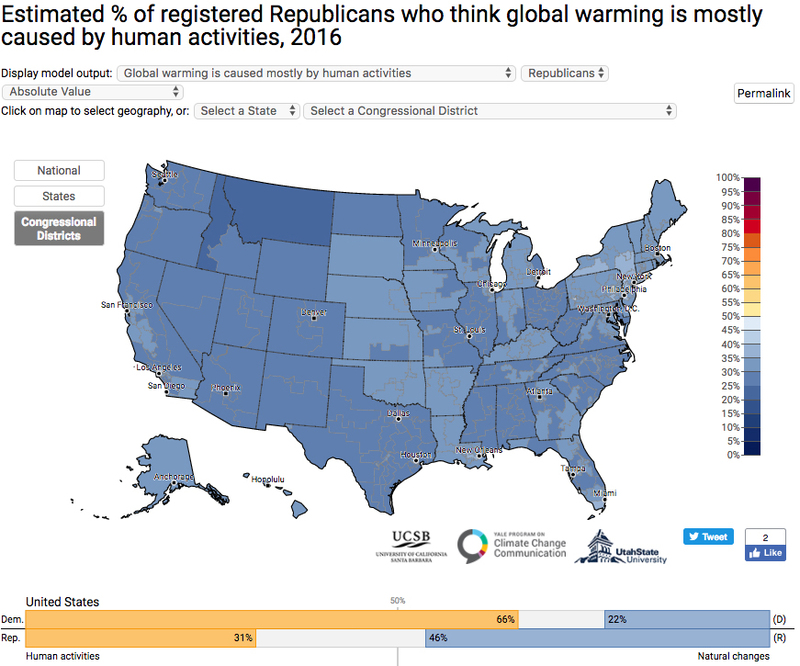 The overwhelming majority of scientists say that global warming is mainly caused by human activity, but this is where Republicans part company with Democrats. Nationwide, only 31 percent of Republicans believe that greenhouse gas emissions are warming the planet, while 46 percent believe that climate change is caused naturally. This idea is particularly pronounced in Montana’s lone district, where only 24 percent of Republicans believe that humans are to blame for the warming planet. In contrast, 66 percent of Democrats believe that humans are driving climate change. In the map below, darker shades of blue indicate higher percentages of Republicans who reject climate science. Perhaps most confusingly, 36 percent of Republicans nationwide believe that global warming will harm people in the United States, but only 32 percent are worried about it. In Florida’s most southern district, one of the parts of the country that is most vulnerable to the effects of extreme weather, 44 percent of Republican voters think global warming will harm Americans, but only 40 percent are actually worried about it. By contrast, overwhelming majorities of Democratic voters in all states are worried about global warming and believe that manmade activities, such as burning fossil fuels, are to blame. In October, the United Nations’ World Meteorological Organization revealed that carbon dioxide levels grew at a record pace in 2016.